Labor • Revisions to data reveal that just when it seemed Utah's recovery was retreating, a rally was taking hold. 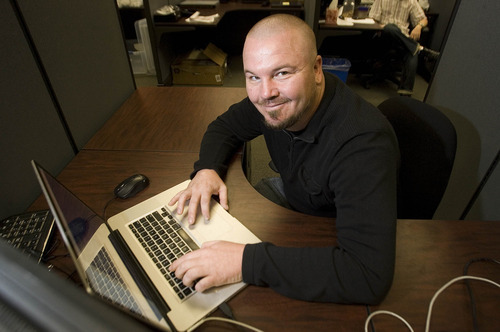 Earlier this year it seemed plain that Utah's ballyhooed jobs engine was running out of steam after a promising upsurge in the second half of 2011. The evidence looked unmistakable. The year-over-year pace of job production weakened unexpectedly in January after seven months of growth that peaked in December at 3 percent  just shy of the long-term 3.1 percent yearly average that had been the norm since 1950. The rate slipped further in February, March and April. The next two months were better, but not by much. And in July the softening resumed, suggesting that Utah's recovery from the Great Recession, if not in trouble, was on hold. But that turned out not to be an accurate account of what was transpiring. "I felt very strongly that the revisions were going to come in higher than the survey," said Mark Knold, the Workforce Services Department's chief economist. "What surprised me is that they came in even higher than my estimates." From the pro-business Salt Lake Chamber to the pro-labor Utah AFL-CIO, a general agreement is building that Utah's labor market is returning to a normal state of health. Yet, the recovery is fragile and incomplete. Tied as Utah is to the political and financial uncertainties beyond its borders, present-day job growth may have hit a ceiling until after the presidential election is settled, the so-called fiscal cliff is sorted out by Congress and the U.S. economy kicks into higher gear. In the right direction • "If they don't show fiscal leadership on the deficit and the debt, I think that will depress growth in 2013," said Natalie Gochnour, chief economist of the Salt Lake Chamber, who notes that many of her members have pointed out they would be hiring even more workers if they trusted the political leadership in Washington. "It's as if you know there's a cliff out there, and until it's remedied, you have to slow down," Gochnour said. "That is the safest way to manage a company right now. I have told people we won't be able to get to historical growth rates until the U.S. economy recovers completely." Still, the labor market in Utah is headed in the right direction. 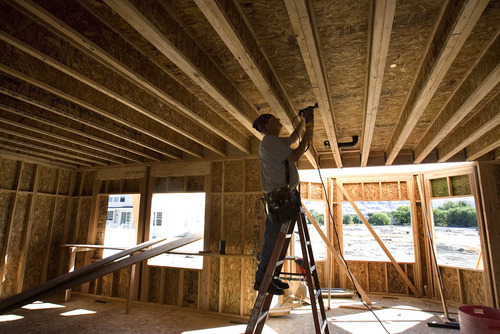 Averaged out, the number of jobs generated Utah between January and June was 3.2 percent more than in the same six months of 2011. That, says Knold, is enough to not only absorb the 20,000 to 25,000 people who become old enough to enter the workforce every year. It's also enough to begin to thin out the ranks of the unemployed, whose numbers reached close to 80,000 during the recession. "You'll have to do that multiple years to erase the deficit upon the labor force that the recession created. But these first six months of 2012 are the first window where we've reached back into that deficit and started to reverse it," Knold said. As one of the most visible prognosticators in state government, cynics might dismiss Knold as overly optimistic. David Stringfellow, an economist in Gov. Gary Herbert's Office of Planning and Budget, notes that the long-term growth average of 3.1 percent represents a blend of years when jobs were expanding by as much as 5 percent with years when the state was losing jobs. Do the revisions "move it from good news to great news? No. [They move] it from good news to slightly better news," Stringfellow said. "It's a little bit less growth than what we are used to in an expansion. This is good news in that growth is a little higher than we thought it was earlier in the year, and we expect the pace of improvement to continue to improve." Quick work • But also listen to Dale Cox, president of the Utah AFL-CIO, the umbrella organization for most unions in the state. Although he attaches caveats to his remarks, Cox thinks the job market has been thawing for more than a year at a "sustainable" rate that lessens the chances for another steep fall-off such as the one that began in 2008 and lasted into 2010, before hiring finally turned upward again . "I believe jobs are being created in the state. We just have to be sure they are jobs that sustain a family," Cox said. "I see a trend at trying to create a cheap labor market. We just have to keep vigilant that doesn't happen." Depending on a person's skills, it can be pretty easy to find a job. It took Matt Hardy three weeks. Hardy, a 37-year-old software engineer, lost his job in February when his former employer laid off most of its workforce because of a drop in sales. For several months, Hardy tried to go it alone as an independent consultant. In early September, however, he decided to look for a job because he needed health benefits and didn't fancy himself as an effective salesman who could line up enough clients. 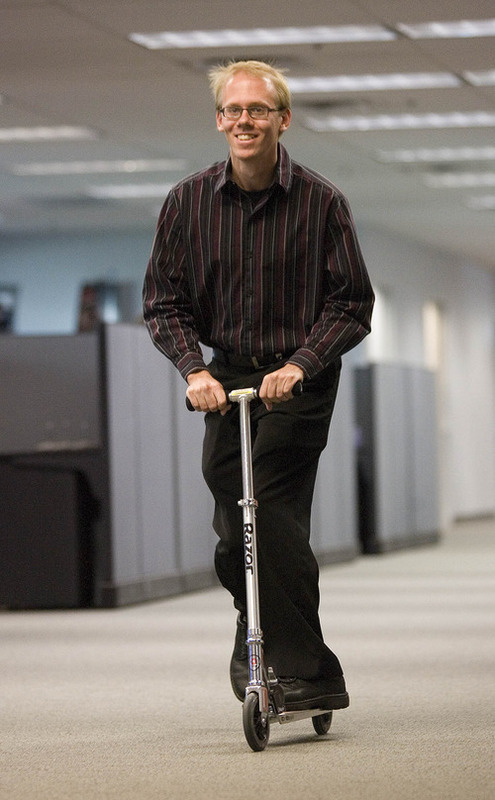 "I did what most tech people do and got on dice.com [a technology job board]. I found about 20 prospects, applied to about eight, had approximately four interviews and then one offer," Hardy said. He went to work last week for SEO.com, a Draper company that helps businesses improve their chances of being found on search engines. SEO is celebrating its fifth anniversary this year. 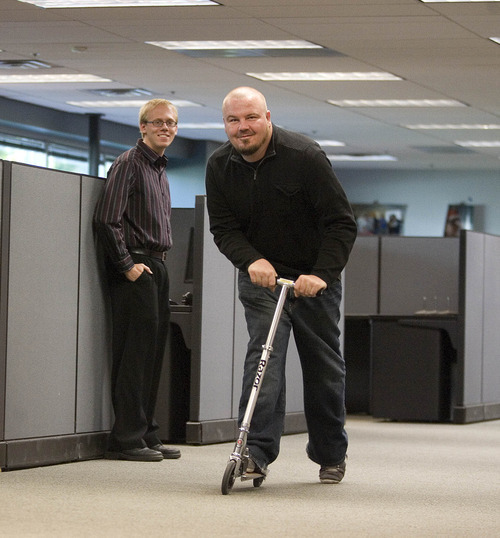 In 2011, it hired 32 employees; so far this year it had added another 38. Diverse growth • His story was emblematic of employment growth in Utah. In May and again in June, the year-over-year gain in jobs was 3.6 percent  a rate not rivaled since August 2007, before the recession started. Sectors where jobs are more numerous today than they were in mid-2007 are education, health care, leisure and hospitality, professional and business services, mining, information services, state and local government. 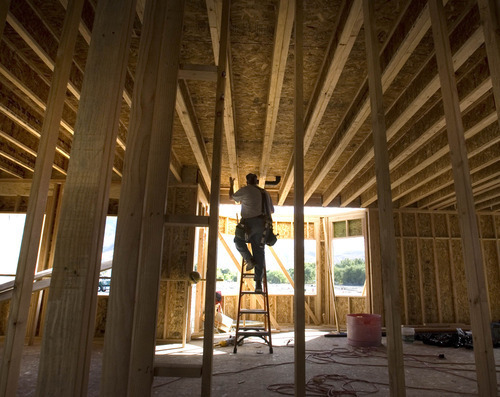 Even the construction sector, socked by the collapse of the housing market, is bouncing back. 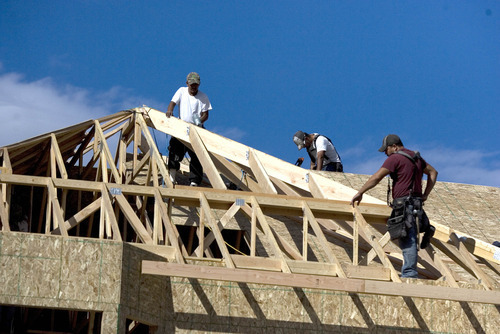 Construction employment hasn't recovered to levels five years ago, but it's growing again. 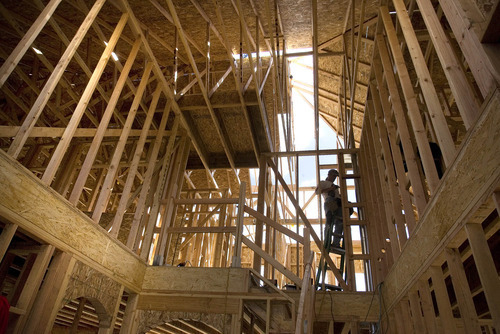 Driving the construction resurgence along the Wasatch Front is new-home demand on two new fronts  an influx of out-of-staters moving in to take jobs with the likes of Adobe and Goldman Sachs, and Utahns no longer worried that they may get laid off. "It's hot. 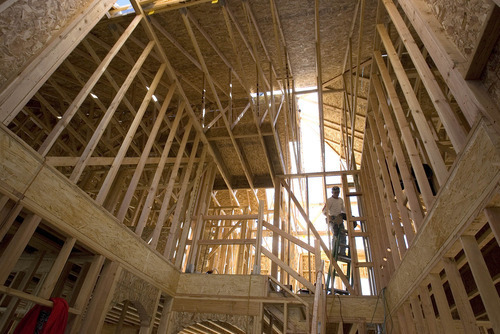 It's really strong right now," said Clark Ivory, CEO of Ivory Homes, the largest homebuilder in Utah. "We are selling in every price category. We are seeing far more transferees  people coming for new jobs that are bringing them in from out-of-state. And we are seeing a greater number of [families] moving up. When the market was first trying to turn around, there was less of that. So that's very encouraging." California software giant Adobe will take possession of its new $100 million Utah headquarters in Lehi on Nov. 5. The company has erected signs along I-15 near the massive 280,000-square-foot structure to announce the date. Close to 1,000 people will work in the building, including 200 that Adobe expects to hire by the end of this year. In Salt Lake City, Goldman Sachs expects to add 300 new employees to its fast-growing office on Main Street by year-end. The increase will bring the investment bank's workforce in the city to 1,600, making it Goldman's second-largest operation in North America and, possibly, the fourth-largest worldwide by next year. David Lang, managing director of the office, won't confirm those previously reported employment numbers, but said Goldman has been able to grow in Salt Lake City as it expected to ever since the New York-based company established a small office in the city in 2000. "As it relates to growth in Salt Lake City, what is most interesting is the diversity," Lang said. "Picture pretty much any activity in New York, excluding sales and trading, and there is a very good chance that it's happening here." Utah a greener pasture • Goldman has been good for job seekers. Lang said the company has recruited graduates from every college in Utah, as well as students "at schools in Colorado, Texas, Michigan and elsewhere." It has also hired more experienced people from other companies inside and outside the state. "The success that we've seen is purely the result of the talent that we have been able to hire in Salt Lake City and Utah. I don't think that's going to change in the future," Lang said. 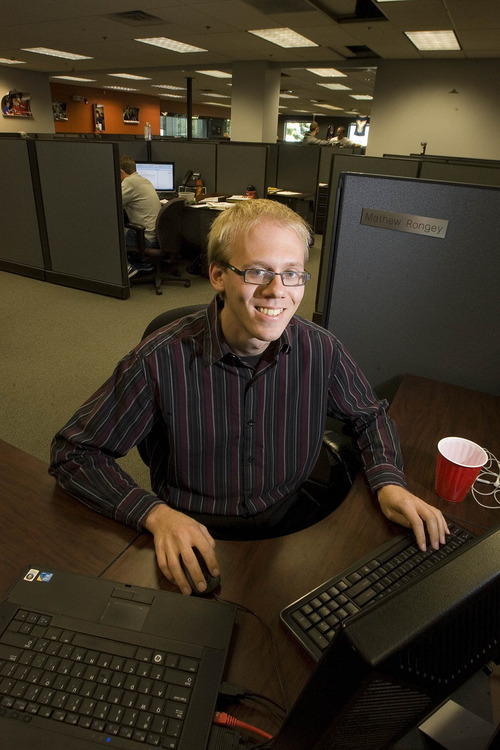 The stature that Utah enjoys as a state where jobs are comparatively plentiful is why Matt Rongey, a 23-year-old graduate of a film school in Southern California, went to work at SEO.com last month. Rongey had been doing some part-time film work for the University of Utah. When his hours were cut back, he decided to hunt for a full-time job. The search took seven months, but that's largely because Rongey felt he could afford to be picky. "I felt like maybe in California I would have to settle for a minimum-wage job, but I felt like since the market here was stronger that it would be worth holding out for a better job rather than taking the first job that I could get," he said. Rongey sent out "thousands" of resumes, which produced several interviews that seemed promising. He accepted SEO's offer to work in its small-business department. "There are definitely jobs available out there for people," he said.